Race driver Cory LaJoie celebated his 23rd birthday on Thursday, then spent Friday helping a friend who was racing in the NASCAR K&N East Series event at Dover Downs Speedway. While Friday was fun for LaJoie, it wasn’t part of his career goal of being a NASCAR Sprint Cup Series driver. Corey is a third-generation racer in his family. His grandfather, Don LaJoie, was a Modified driving legend at the former Danbury (Conn.) Fairgrounds Racearena. His dad, Randy, started his career as a local race driver, then drove to two NASCAR Nationwide Series championships before retiring. He now is a noted leader in racing safety and builder of The Joie of Seating. With a family effort, young Corey gained attention on the NASCAR K&N Series as a race winner. The family money took him to ARCA, before it was time for him to move the next steps up the ladder on his own. Corey signed a driver development deal with Richard Petty Motorsports over the winter, but has yet to drive for them. 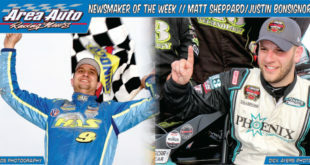 He has competed in two NASCAR Camping World Series Truck events for Ricky Benton Racing; and just the weekend before Dover, at New Hampshire, got a shot at NASCAR Sprint Cup racing in the Randy Humphrey No. 77 driven earlier in the year by Dave Blaney. “Honestly I don’t know or I’d tell you,” said LaJoie on Friday at Dover when asked where his racing future was headed. “I feel like some things are going very well with the Petty deal,” said LaJoie. “I’ve still have four Nationwide series races left in the No. 98 car.” Those include one in his hometown in Charlotte, N.C., along with Texas, Kansas and Homestead, Florida. Corey is a young man in a hurry to get to the top of NASCAR racing. But without a big checkbook or a sponsor to pay the bills, LaJoie realizes he must be patient. He took the ride in the No. 77 to get him into the Cup garage, knowing the team doesn’t have the finances to be a front runner. He timed 41st and finished in the same spot. With Benton’s small Truck team, he finished tenth at Kentucky and had a good day going at Bristol before problems pushed him out of the spotlight. LaJoie’s own family team has been parked after his dad taught him the lessons of the sport and got him to where he is today. On Friday at Dover, Corey was helping good friend Brodie Kostecki of Perth, Australia who ended up fifth after starting 15th. “I was trying to help him get it figured out,” said Corey. Corey might have a future as a crew chief. Earlier this year he was a last minute replacement for respected crew chief Harold Holley for a K&N team car driven by Cale Conley on the New Hampshire mile. While crew chiefs make a good living in the sport, Corey isn’t ready to yet give up on being the man behind the wheel. While still very young and extremely talented, Corey was watching drivers on Friday that were much younger than he is driving for well-financed teams. He is, however, very proud of how he’s gotten to this point. LaJoie said he fills his spare time jumping from the shop of the Fred Biagi No. 98 Nationwide team he’ll drive for later this year, working out to be in shape, doing mountain biking and helping his dad build racing seats a day or two a week. The clock is ticking on LaJoie. Younger drivers such as Kyle Larson have driven right past him . Corey can’t buy his way to the top, but when his talent proves he can do the job, his ride will be one he’ll appreciate that much more. SAMMY SWINDELL SIGHTING – Since retiring from Sprint Car racing, Sammy Swindell has been attending NASCAR events in which his 25-year old son Kevin is competing. 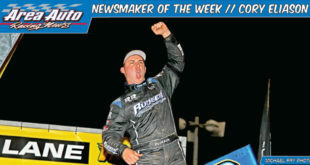 At Dover last weekend, the three time World of Outlaws Sprint Car series driver drew attention in both NASCAR Sprint Cup and Nationwide garages as well as on pit road when he jumped into his son’s Nationwide car after time trials and drove it back to the pits. While Sammy, who will turn 59 on October 26, spent some time racing on the NASCAR Truck Series, it’s his Sprint Car career that drew the attention of drivers, crew members and fans. Swindell left the World of Outlaws tour prior to the high paying events in August in Knoxville, Iowa. He wanted to get the Big Game No. 1 team ready for the $150,000 to win Knoxville Nationals, so he left the tour after the Kings Royal at Ohio’s Eldora Speedway and didn’t return until the Nationals. After the Nationals, however, Swindell surprisingly announced his retirement from full-time Sprint Car competition. 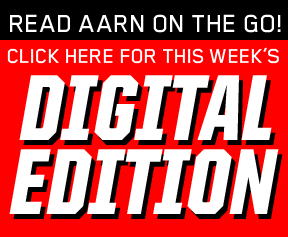 He didn’t rule out a return for special events and was certain he would again run at the indoor Chili Bowl Midget Nationals in January in Tulsa, Okahoma. Sammy and Kevin have dominated this event in recent years. At Dover, Swindell said he decided it was time to focus on helping Kevin advance his career in NASCAR racing. With Kevin’s schedule calling for him to run a string of Nationwide races leading up to the end of the season, Sammy knew it was his son’s big opportunity at success in NASCAR and wanted to do all he could for him. While Sammy’s not wrenching the car, he is providing Kevin with added exposure and working to use his influence in getting his son to the next level. He talked to many, including Tony Stewart about his son, hoping they might be able to help him. So far, Sammy has been able to stay away from Sprint Car racing, but he’s also not making any money by doing so. “I don’t miss it,” said Sammy. Sammy, Steve Kinser and Doug Wolfgang were the original stars of the World of Outlaws tour. Sammy feels he can still do it, but is frustrated by the current state of Sprint Car racing where passing has become so difficult. He feels much of the problem is with the Hoosier tires that are currently mandated in 410 Sprint Car racing across the country. 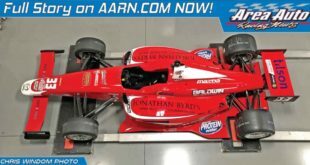 While most drivers were happy to see Hoosier replace Goodyear as the tire supplier two years ago, the tire they must run isn’t the same design Hoosier that they had wanted. He said one rear tire is a four ply design and the other two ply. One is also softer than the other and he said it has made for bad racing. Since the tire change, both Swindell and Steve Kinser have struggled. “I think only Donny Schatz has figured it out,” he said. Wolfgang’s career was cut short when he was badly injured in a fiery crash. Kinser is retiring from full-time competition at the end of this season. Will Sammy Swindell return for next year? Will he do his own farewell tour? “I know I’m in better shape than Steve,” said Swindell with a grin. “But I’m not coming back just to sell t-shirts. If I know I have a chance to win I might.” Swindell believes today’s Sprint Car racing is more about the luck of the draw than his driving style of sitting up in the seat and gassing it. Dover was frustrating for the Swindells. Just prior to leaving for Dover, the crew chief quit when a request for a much needed added crew member was turned down. With just three crew members at Dover, the team bought limited tires and skipped the final practice on Friday despite timing in 24th fastest. The plan wasn’t to run the entire distance, but Kevin was involved in a crash on lap 38 that ended his seventh Nationwide start of the year in a Dodge sponsored by Curb Records. Kevin has proven himself in open-wheel racing and also in stock cars. Earlier this year as replacement driver, he won for the second time in ARCA competition while running for the powerful Venturni team. Both Kevin and his father hope they’ll make an impression in his remaining Nationwide races this year that will vault his NASCAR career into quality rides in the future. MOON SHINES ON DIRT OF ASPHALT – Many years ago, Modified drivers would race both on dirt and asphalt surfaces using the same race car. But with the advent of specialized cars for each surface, drivers were forced to pick their favorite and ran on one or the other, with rare exceptions, not both. Joe Mooney is one of those exceptions, a throw back to those old days. 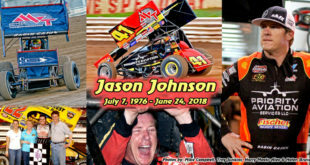 He grew up racing on the pavement at the track closest to his Lehighton, Pa., home, Mahoning Valley Speedway. But for the past two years, he’s taken a liking to competing on the dirt as well at Pa.’s Big Diamond Speedway. 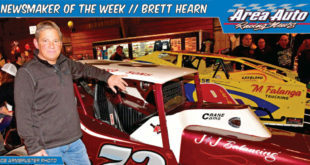 Mooney, a five-time winner in Street Stock competition at Mahoning, got a chance to drive an asphalt Modified several years ago for Lorin and Erica Jefferson and brought it home with a feature event win in 2011. He also won in a Jefferson-owned Late Model in 2009. 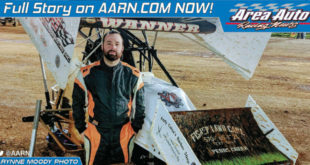 Health issues, however, forced the Warrens to leave the sport. Mooney had a decision to make. A fan of dirt racing as well, Mooney said the cost of tires (about $700 a set) for a pavement Modified was too rich for him, so he bought a dirt Sportsman car and gave Big Diamond a try in 2013. After finding success, he purchased a 358 engine for this seasonand moved up to the headline division. Mooney said he felt comfortable in the 358s this year and had put together several top-ten finishes at Big Diamond. 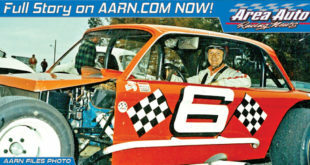 He then suffered a bad July, “junking the car” in a rare start at Pa.’s Grandview Speedway during a RoC Tour event. While Mooney wasn’t racing at Mahoning Valley, he always attended to help his two younger brothers, Josh and Justin, with their Street Stocks. One night during 2013, the driver of Geary Rinehimer’s No. 39m Modified, Rick Kirkendall, left the team. Mooney, who said he always brings his helmet and uniform with him just in case, was offered the ride. Unfortunately, a crash ended the season as quickly as it began after just one race. He left, however, a good impression with the car owner. When the 1995 Troyer was ready to go racing again this summer, the car owner wanted Mooney to drive it but he had lost his phone number. Knowing Joe is usually there with his brothers, they took a chance and towed the car to the track. The team has been racing the last seven events together. Going into Saturday night’s feature, Mooney’s best finish was an eighth. He had led just one lap. A pole starting position in Saturday’s feature helped set him up for a great evening. The 28-year old driver led the first 40 circuits of the main despite great pressure the entire distance. Had the event been of the regular distance, Mooney would have taken the win. But Saturday’s race was a special 50-lapper and he just wasn’t able to hold on. After losing the lead, he almost lost it all when, after contact from behind, he got sideways on the backstretch. He was able to straighten out the Modified and finish a still very respectable sixth. Mooney did grab a win at Mahoning just the weekend before, when he drove his brother Justin’s Street Stock to victory lane. LEGAL CRATE: Ian Humphrey had his 602 GM Crate engine protested by another competitor prior to the All Star Cup Shootout at N.J.’s New Egypt Speedway two weeks ago. After finishing seventh, Humphrey’s car was impounded at the tech area where the engine was removed. Track official George McKelvey than took the engine to a dyno on Monday morning where it was deemed legal. A member of Humphrey’s team drove to McKelvey’s shop later that same day and picked up his motor, giving him time to put it back in the car so he could race this past weekend at N.J.’s Bridgeport Speedway. For their troubles, the Humphrey team will now get a precentage of the $1,000 protest money.